Global Training Center Opens in Indonesia Educational Facility for Manufacturing Skills and Craftsmanship - News Releases | Yamaha Motor Co., Ltd.
Yamaha Motor Co., Ltd. announces the opening today of the new "Global Training Center", located within the complex of PT. Yamaha Motor Manufacturing West Java (YMMWJ), the Yamaha Motor group's Indonesian motorcycle manufacturing company. The role of this new educational facility is to train technicians in the skills of manufacturing. The facility's opening ceremony held today was attended by Indonesia's Minister of Industry, Mr. Fahmi Idris, Yamaha Motor Company's President Takashi Kajikawa and President Yoshiteru Takahashi of YMMWJ, PT. Yamaha Indonesia Motor Manufacturing and PT. Yamaha Motor Kencana Indonesia. The new Global Training Center has been constructed as a facility to contribute to the task of training employees in standardized manufacturing technologies and skills for use in Yamaha manufacturing bases around the world and developing human resources. The single-story building has a floor space of 5,760 m2 and includes a classroom area with a large meeting hall that holds up to 400 people, as well as numerous classrooms and a practical training area with equipment for training in welding, machining, assembly, painting and finished product inspection/testing. There is also an examination area with a hall for written tests and interview rooms. 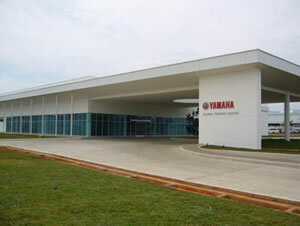 Until now, the global Yamaha Motor group has operated separate training facilities at its various manufacturing bases where basic work knowledge, skills and techniques have been taught. However, the group encountered difficulties in achieving a worldwide standard of technology and skill levels for all its manufacturing bases around the world. The newly opened Global Training Center will first be used to train new employees at YMMWJ as the company expands production capacity to meet the growing motorcycle demand. The facility will then begin receiving trainees from Thailand, Vietnam and other countries to be trained according to a world-standardized curriculum as technicians, supervisors and manufacturing technicians for the Asian region. In addition to the existing localized training programs and reception of trainees at the corporate headquarters in Japan, the Yamaha Motor group will establish additional world-standard Global Training Centers in other regions with the aim of developing human resources and raising the level of expertise in manufacturing skills and craftsmanship.